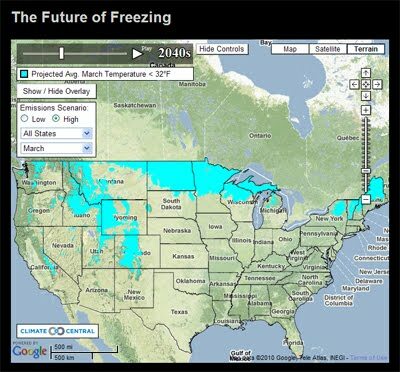 Climate Central are launching a new interactive Google Map, which allows you to view areas of future freezing in the month of the March in the U.S. The map shows high-resolution projections for future average March temperatures in the U.S. through the end of the century, focusing on where the average temperature is expected to be above or below freezing. You can use the time controls to scroll through the years, or click "play" to view an animation. You can also compare low vs. high carbon pollution scenarios. While warm weather lovers may like the idea of warmer Marches, this would mean earlier snowmelt, which has been linked to drier rivers and forests later in the summer, and very much higher wildfire activity in the American West. We could also expect water shortages for farm irrigation and trouble for trout and other cold-water stream life. See how your area will fare by visiting the map now! The last day of March is typically the warmest day of the month. Today, scientists at Climate Central are launching a new interactive Google Map, which allows you to view areas of future freezing in the month of the March in the U.S.